The woman who so many of us knew as Ursula didi (big sister in Nepali) died on January 30thin Bremen, Germany. “She will remain in my heart for forever as my loving sister,” said ETC’s Director Mira Rana who organized a puja (prayer service) with 108 candles in her memory at Shoyamabhu temple in Kathmandu. Some 15 present and former ETC staff, as well as ETC Nepal Board members,participated. A close friend of Ursula’s and an early ETC collaborator, Mr. Kiran Dutta Tewari, told those gathered about her valuable contribution in founding ETC’s Women’s Empowerment Program andGirls’ Scholarship Program which together gave birth to ETC’s Integrated Community Development model. “She made a huge contribution,” added Mira. Kiran later wrote about the ceremony that, “We all gathered in heavy icy rain under umbrellas, to pay respect to the wonderful woman who travelled from such a long distance to bring joy, pride and help young women and girls.” Mira told those assembled that Ursula was radiant when they walked together through dozens of rural villages, pleased by the opportunity of spending time with women in their fields. I couldn’t agree more. When I was ETC director (1997-2000) Ursula didi was a constant sounding board for the challenges of running a small non-profit organization in one of the world’s poorest countries. She was wise, compassionate and intelligent, characteristics that all of us who worked with her very much relied on. 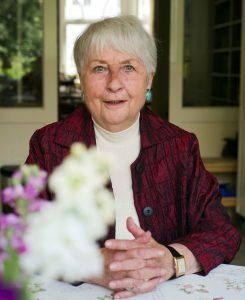 Just like Pamela Carson, Barbara Cook and Dan Sisler, all of whom were critical in making ETC what it is today, Ursula’s legacy lives on in every woman who learns to read and write, every girl who stays in school and every family whose life has improved because of ETC.